Throughout the ancient island of Sardinia, the story of the indigenous Nuragic civilization lies obscured by unanswered questions. Although one can examine thousands of their laboriously-assembled structures, megalithic graves, and meticulously-crafted artwork and figurines, the greatest ponderings remain. What became of these ancient people of the Bronze to early Iron Age, and how does their existence tie in with other civilizations? To ascertain these answers, one must begin with the nuraghi. Arguably the most well-known pieces the Nuragic left behind were their nuraghi structures or towers, of which approximately 7,000 have been discovered upon the island - but up to 30,000 may have been constructed. Although similar in features to many other structures throughout the Mediterranean region, Sardinian constructs were most original and stately in their formation. These structures are circular, most often created with a flat, truncated rooftop similar to those of other ancient populations, but with the earliest of this classification dating back to 18th century B.C. Some believe these types of rooftops were likely maintained and used as terraces. Others, however, form a conical bee-hive shape on top. Minimally-dressed stones were applied in cylindrical succession to form the building within which was typically a corridor, an inner space (some nearly 40 feet in diameter) and a stairwell leading to upper levels accessed via a ground level entrance. Some more intricate dwellings additionally feature wells, ground-level silos or other spaces presumably for the storage of liquid or dry foodstuffs. 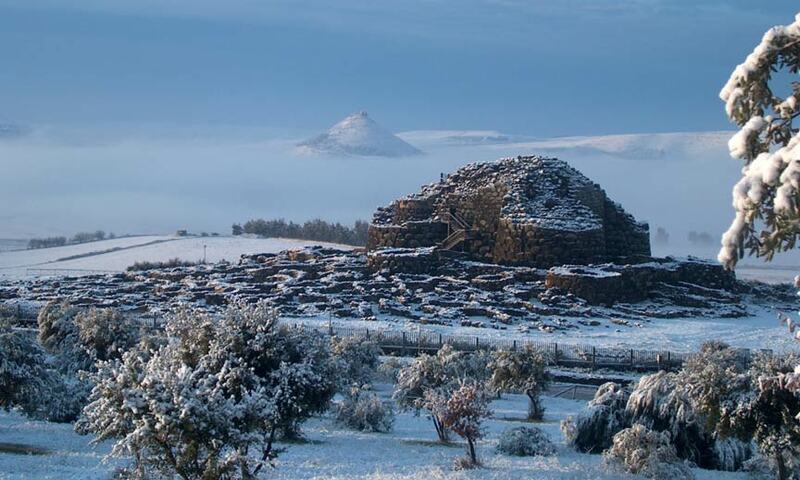 Some nuraghi stand as high as ninety feet tall, such as the Nuraghe Arrubiu (see pictured), but many earliest erections are of much humbler heights, and the construction plans varied considerably from simplest versions as well. The purpose of these structures, the latter of which display increased mastery and efficiency in assembly, has been debated (from grain silos or observatories to temples or fortresses), but artifacts discovered within some (including stone tools, loom weights, hearths, cooking vessels, spindle whorls, and animal bones, to name a few) lead many to the conclusion that the nuraghi were utilized as homes or for predominantly household activities. Several of such towers with varying complexity built in close proximity to one another with a common well and courtyard, usually surrounded by megalithic walls, are widely agreed upon to have likely been bastions, necessary for territorial protection in the age. Most complex groupings that developed into settlements, have also featured numerous huts of greatly varied complexity, many of which had basin-like arrangements around the walls for water to likely be held, spaces of enclosure for animals, antemurals and turrets with even lookout towers and other such structures of defense. Pastures, wooded areas, mines, religious temples and other assets may have accompanied most of the more complex systems. Sadly, many of the original structures are now in ruins, possibly without prior excavation having been conducted, or have been destroyed, largely for more recent purposes of reusing the stones for other functions like roads and modernized enclosures. The megalithic graves, commonly referred to as "giants' tombs", have been most prevalently found in central Sardinia, although spaced evenly throughout. These graves were likely the resting place of dozens of persons, up to possibly hundreds at some locations. With such spacious, extended burial chambers of up to sixty feet and exterior enclosures of nearly ninety feet, it is asserted that the Nuragic took great care to remain close to their dead, believing they had transformed into gods or similar heroic figures. It is likely they performed and later repeated rites of ancestral honor not only at the time of burial, but at significant interval periods in time, with some even suspected of sleeping aside the deceased for healing or magical purposes. Adorned with various stones, holes, betyls and other decorative features with debatable spiritual or magical significance, it is widely speculated as to which inhabitants were buried within the giants' tombs. Older tombs were likely less discriminating in the distinction of inhabitants, while more recent developments may have included smaller, more specific groups or clans. Spiritual practices appear to have been most often related to the dead, connections to the afterlife, and rituals of water, as exemplified in the majority of architectural discoveries. Offering benches, stairwells to sacred springs and enclosures of sacred wells are of greatest interest, as are the possible beliefs concerning the magical properties of the water therein. Based around this are the numerous Nuragic sanctuaries, or the greatest of sacred springs, within which meetings of high significance are thought to have been held, possibly with participation from neighboring/warring tribes, and around which many other buildings and temples were constructed and sometimes connected. Substantial numbers of the Nuragic's famous Bronzetti statues have been found near or within these areas, giving credibility to the suspicion that they were left as a form of gratitude during religious rituals, or in hopes of gaining strength or prowess in certain specific life endeavors. Having lived on the island for over 5,000 years, one must consider that the Nuragic's trade or exchange practices with other areas likely had a place of some prominence with consideration to the metals - namely bronze - being developed at the time. Bronzetti statuettes, among other art made of stone, abundant pottery, and bronze objects of the time, were widely shared and found in similar form throughout the populations and occupied regions of the age. Most of the statuettes represented men, women, ships, animals, imaginary entities and miniature replicas of the daily tools of living. Many were found to be in exact replication of an action assumed to be of desired spiritual intervention, especially when left near sanctuaries, such as a woman sitting with an ill child in hopes of a cure bestowed by divine forces. Other examples are of warriors with weapons and shepherds with sheep, and even those presumed to be women of high spiritual significance, while nearly all were found to be displaying the nuragic daggers tied around the neck. Evidence suggests that the Nuragic had connections with other parts of the world, but also sustained themselves in isolation for some periods of time. Most references made to them was done so by later groups, primarily the Romans, and while no written evidence from them has been found, it is subsequently believed they had no written language. What little has been compiled appears to have originated centuries after their demise via the passing down of oral traditions. Most agree that the most significant years of decline occurred before the Carthaginian conquest of the late 6th century B.C. ; however, what preceded that prominent occasion is arguable. Many have felt the decline of the civilization in later years meant a popular phase of turning away from Nuragic traditions in favor of others such as the Phoenician, ultimately leaving the Nuragic cultural and religious practices in the past. Others have speculated that a mass disruption or invasion from the outside may have occurred, and still more insist that changes in the ecosystem, moral or overall community cohesion, and/or technological events or improvements may have been to blame. In recent decades, there have been discoveries in Israel which appear to connect to immigration from this civilization, possibly linking Biblical sources to its origins. Featured image: Famous structure of the Nuragic civilization. Su Nuraxi of Barumini, included in the UNESCO list of World Heritage Sites since 1997 ( public domain ). Balmuth and Tykot (1996). Recipes for Sardinian Bronzes . Journal of Roman Archaeology, 39. Tykot (2002). The Nuragic Civilization of Sardinia – A Link to Ancient Israel? Biblical Archaeology Review. Read more about Did a Comet Destroy Ancient Sardinia?